Our newest UK66-LE unit kitchen is now on display in our new showroom here in Catasauqua, PA, and it’s a real Beauty! We added only two custom features to our standard UK66 (our most popular mini-kitchen), the Sunburst grid pattern on the upper doors, and the Asian crown design. 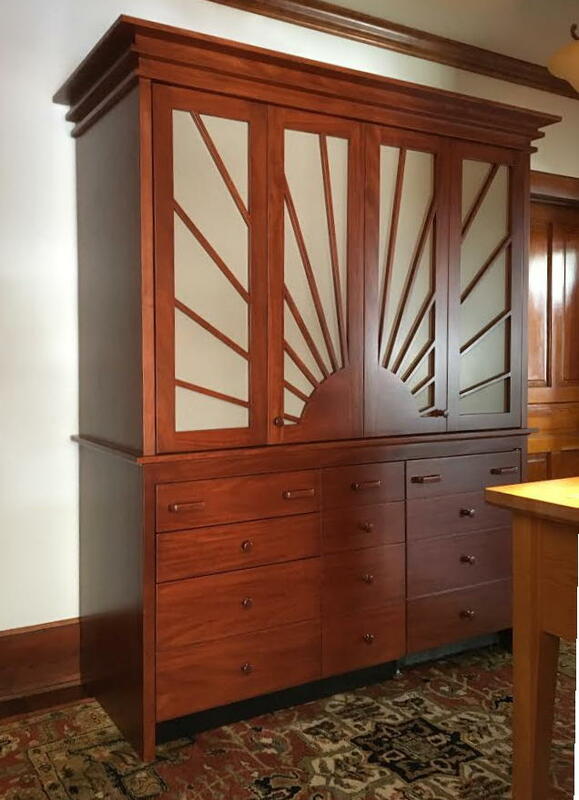 We built this design just to show you how flexible our design choices really are and we challenge you to create unique designs of your own. But what is inside is the real story. 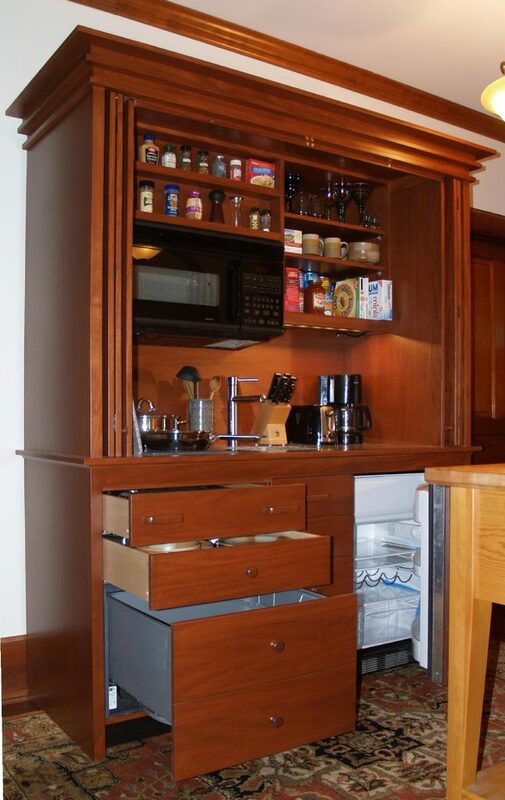 This unit kitchen (compact kitchen, mini-kitchen, kitchenette, all-in-one kitchen; are all terms for the same thing) is a workaholic Beast and we are going to show you how hard it can work for you when you only have five and half feet of width to work with! The interior features extra deep counter tops and full extension drawers. The 120 V induction cooktop comes with its own set of pans that can store in the drawers below. 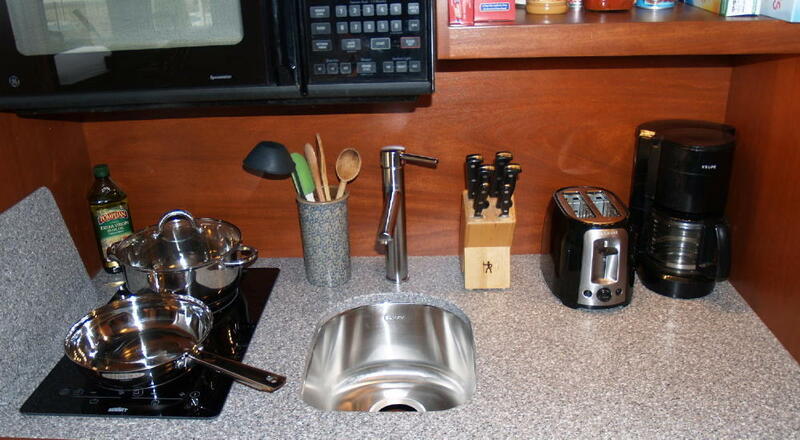 The sink is large enough to accommodate any of the largest pans. The solid surface countertop has plenty of room for the essential small appliances and cooking utensils. The assortment of ovens that are available above the cooktop include simple microwave/ hood models to the more versatile Convection/ Microwave/ Hood models and even the 120 V GE Advantium speed cooker. 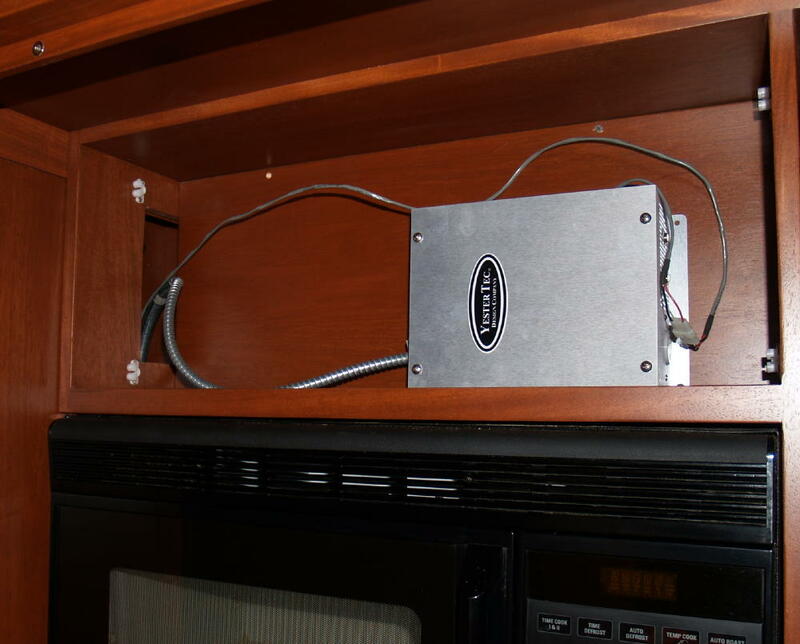 Above the oven is a removable spice rack that conceals the YesterTec control that controls the power to the oven and cooktop. Only when the pocket door is back in its slot will the oven and cooktop operate. This safety feature is UL Listed, unique to the entire industry and your building official will love it! To the right of the oven are three adjustable shelves. Keep your essentials here, dry goods, glasses, mugs etc. An LED light is under the bottom shelf, no other lighting is needed as the oven has a light above the cooktop as well. Below the countertop to the right is a Summit Refrigerator/Freezer. It is the least costly model we offer as it has a manual defrost freezer, but we wanted to show you what this model can accommodate at its nominal price. Other models include U-Line’s auto-defrost door models and Kitchen Aide’s drawer model refrigerator/ freezer/ice maker, both substantial upgrades. In the center is the under-sink area, big enough for a garbage disposal, a small trash container, as well as cleaning supplies. 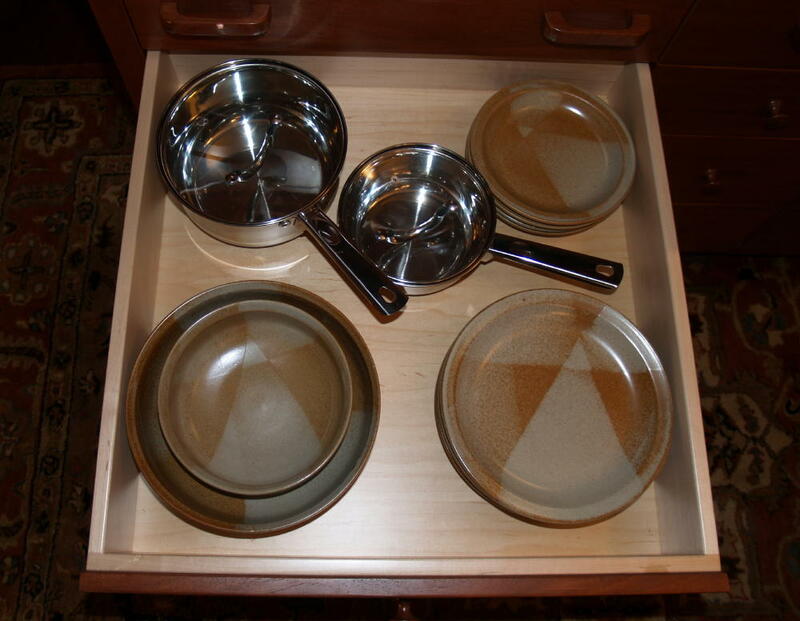 Two full extension drawers under the cooktop can store cooking and eating utensils, dishes, pots, pot holders etc. 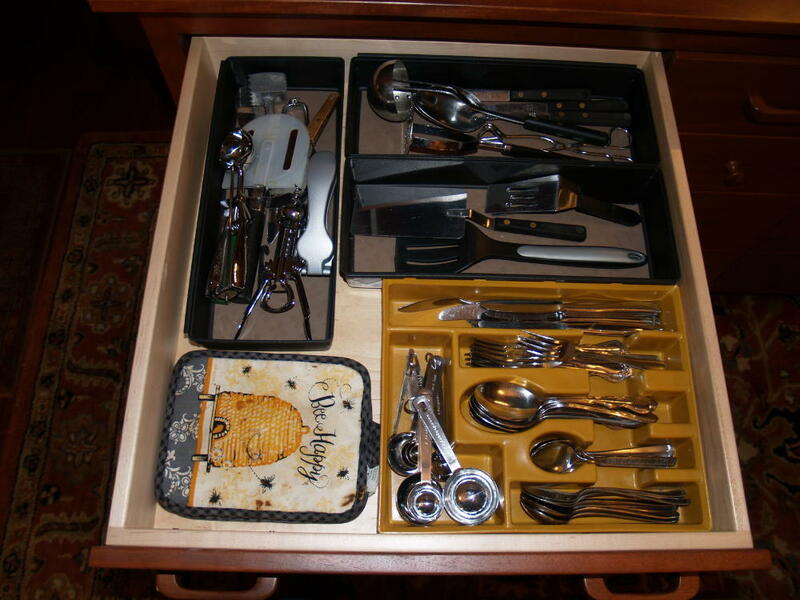 We do not believe that fixed drawer organizers are appropriate because with simple Rubbermaid organizers as shown here, you can get far more items into the drawers. Remember, this is a complete kitchen in only a very small space! 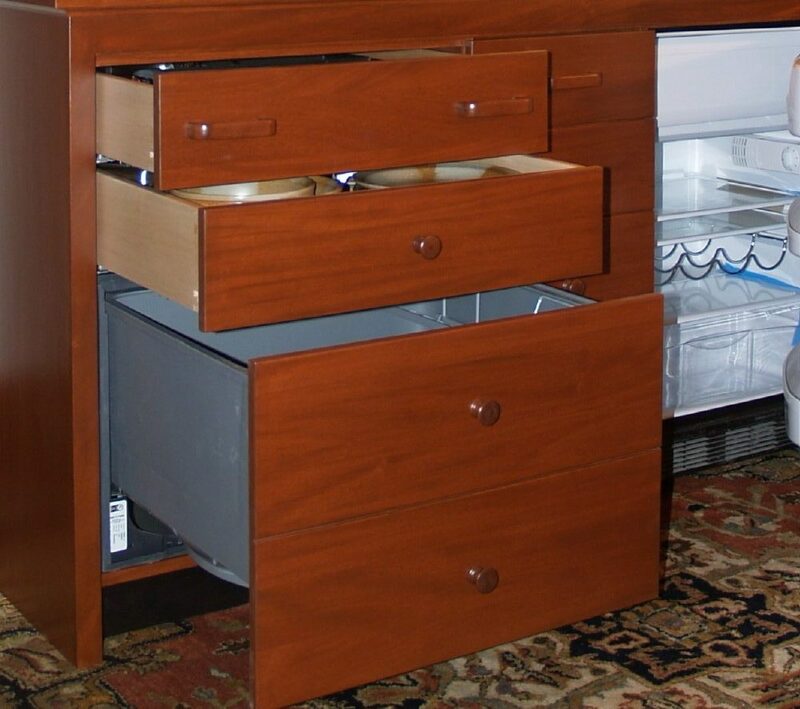 Below the two drawers is a single drawer Fisher and Paykel Dish Drawer. 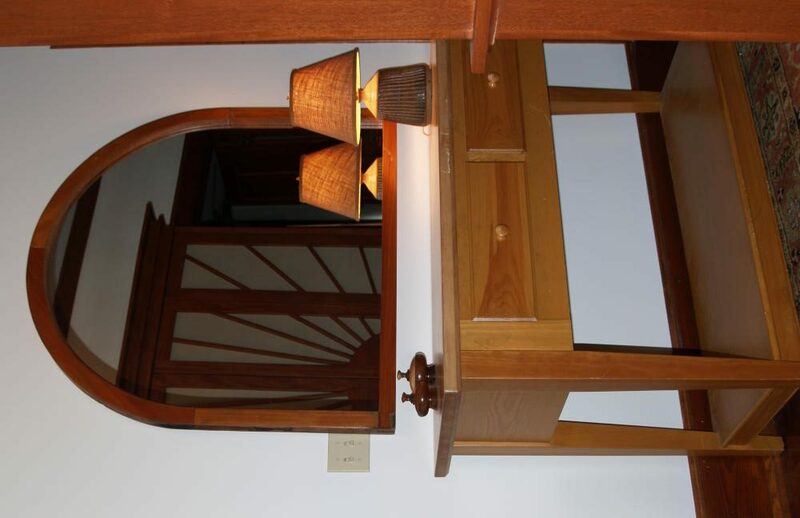 It is an option, and if it is not required, the space becomes an additional drawer. But having a dishwasher is a real treat just ask my daughter who lives without one! 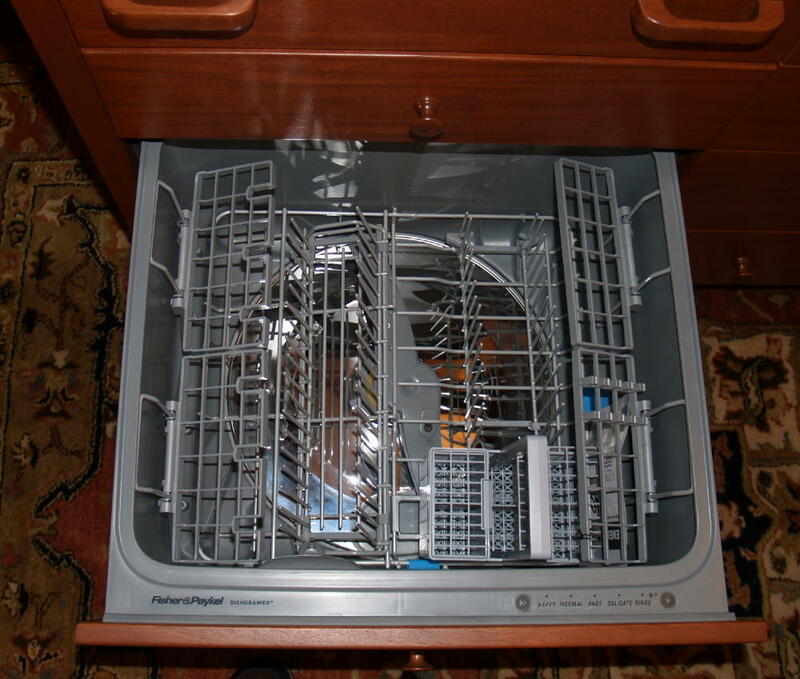 The Dish Drawer can also be used to store dishes! 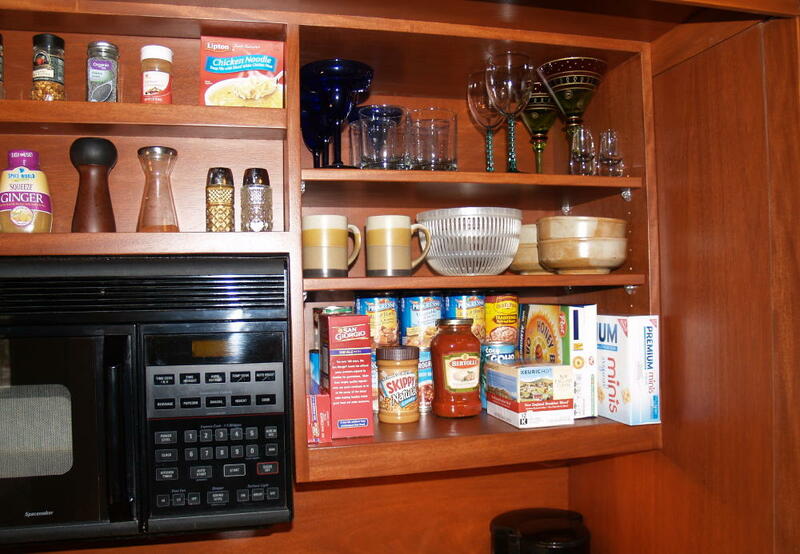 If you have extra space in the room, you can add an additional YesterTec piece that can complement the unit kitchen. 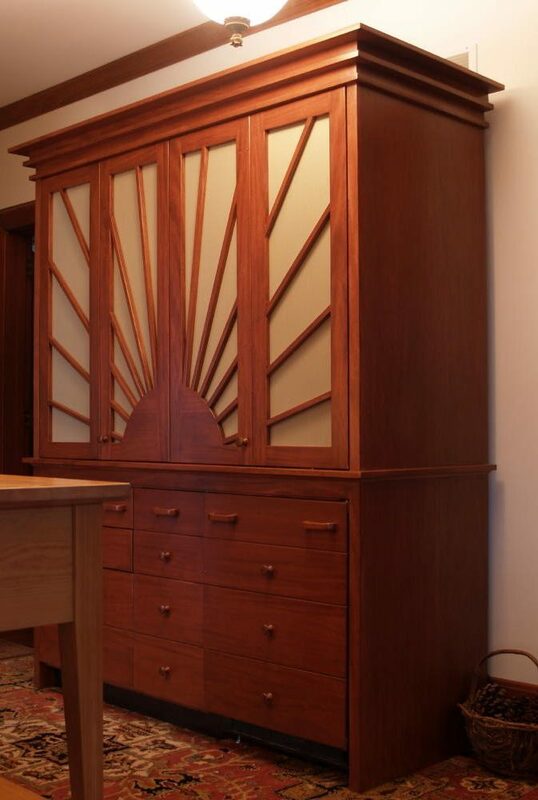 And the pieces do not need to match, remember, they are furniture, not cabinets. 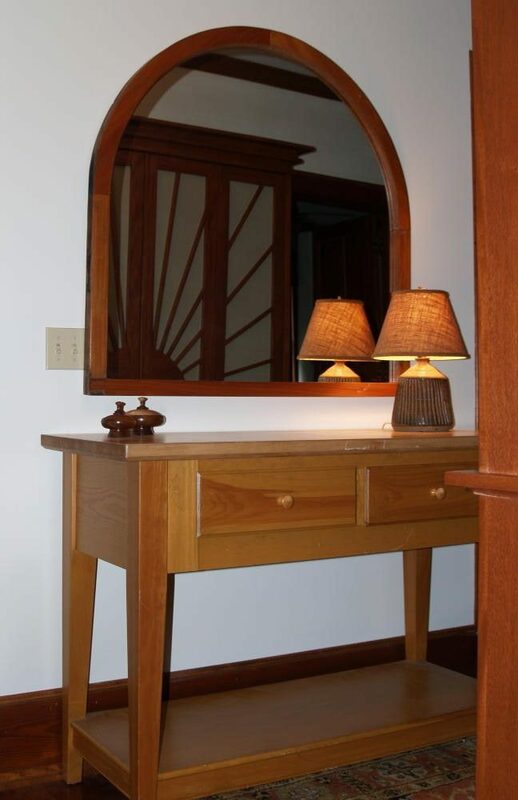 Here, just across the hallway is one of our Old English Pine worktables shown with a butcher block top. That’s right; this space is our entrance hall! Imagine a complete two piece kitchen in your entrance hall? These sculptural pieces are designed to go into any room that needs to be more than just a kitchen. They are great for one room living areas, or anywhere you need a kitchen, but don’t want to see an exposed, messy kitchen all the time. It’s a kitchen for any room in the house. Style it. Own it. Enjoy it! As shown: $11,631 plus shipping. The starting price for this model in natural maple is $9588, without the dishwasher, custom doors and cornice.